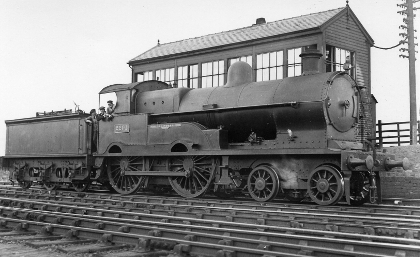 "George V " class 4-4-0 No. 2291 "Gibraltar" poses in front of a signal cabin - where? The signal cabin is a comparatively uncommon Type M, and has a brick chimney. Double height base with a chimney; might it be: Hillhouse No.2 Red Doles lane, Huddersfield. My only comments concern the painting of the Signal Box. The Light Buff is rather dark; the Dark Brown is rather light; and the White [around the windows] is non—existent! The Brown was characteristically liable to fading — Maroons are better for this. And do I remember very faded CLC Browns in the early fifties! Sorry, that’s all I can add just now. Worry not, Peter. Painting styles changed from time to time and from place to place. Maybe not painting the window frames white was simply a WW1 thing — but then again, who can say? Some LNWR ‘experts’ insist that you can’t say ‘signal box’ — it has to be ‘signal cabin’. But then they’ve obviously never actually looked into the actual LNWR records, where both terms are used. So maybe signal boxes sometimes, somewhere, were painted in other ways than the usual version. This is Hillhouse No 2 [Huddersfield] viewed from the north. Over the photographer’s right shoulder is Hillhouse shed. To front of the cabin are: south up fast, south down fast, north up slow and north down slow. The [double] junction diverging to the right forms part of the up/down goods [avoiding ?] lines which passed behind Hillhouse shed splitting at Hillhouse No .4 to make the up/through and slow ditto the down lines, serving the goods and coal yardshere and rejoining the main lines at Hillhouse No 1 with the bi—directional ‘fifth line’ on the viaduct serving the goods yard and warehouse behind the station. Even in its twilight years it was a busy and exciting place for a young strapper to while away his time. Maybe the white-painted window frames have turned grey because of smoke from the nearby engine shed. Peter’s mention of the CLC has reminded me that during or just after WW2 I saw signal boxes on that line painted all—over khaki. I think Glazebrook West Junction was one of them. They say picture paints a thousand words and I maintain works and mill chimneys —to say naught of a power station, a gas works and an ICI— will undo the work of any painter in short order. This link to Britain from above will give you some idea of the source of the ‘weathering’ environment. To the left of the top/centre chimney is Hillhouse No.1 and to the right the LNWR coaling stage and the shed is extreme right. Hillhouse No. 2 is out of shot further to the right. Note the lack of vegetation on the embankment and the distinct absence of boskage in the area; a feature much changed today. This engine is said to be ‘Gibraltar’ No 2291, and although the photo is very unsharp, there is obviously something wrong with the numberplate. It seems to read “2214” — with the last two digits in some non—LNWR typeface. The whole plate seems to be sloping down to the right, and looks like a not—very—skilful piece of photo—retouching. Why anyone would do this is another mystery. Harry. I suspect there is some computer jiggery pokery in the image. All straight lines appear to have a barley twist: handrail, rail heads, flare to the tender tank top and the end boarding to the cabin; could this account for the number plate distortion? The lighter paintwork showing through the grime by the end window looks to coincide with a metal ladder attached to the window cleaning gallery, which I would have thought might normally have been accessed through an open window, could this have been a short cut to what appears to be the Thunderbox visible just behind the cabin. At the risk of lowering the tone by discussing the engine, it is worth mentioning that its condition enables the picture to be dated as ‘early LMS’. It has: a Belpaire firebox; cut-back cab roof, conforming with the LMS composite loading gauge; hand rail on the cab side; and a ‘supplementary’ oil box on the boiler hand rail; but it still retains LNWR lamp sockets — not yet replaced by LMS lamp irons, which generally took place soon after the Grouping. The tender is the final 3000—gallon type. A quick glance at Baxter shows the Belpaire firebox was fitted in June 1925 and the engine was renumbered 5356 in November 1927 — nicely placing the picture between those dates. Gibraltar was built in June 1911 and so would have been a splendid sight when emerging from Crewe paint shop having been given the full treatment — gleaming black paint with full lining, Here it is in plain black and must have been repainted at least once since the start of the war, lining out having ceased immediately the war started in September 1914. One question remains: who was the photographer? There is an obvious candidate for pictures taken at Hillhouse at this period — P. F. Cooke. Cooke was supremely competent — his enlargements are quite magnificent. It might help to establish the photographer’s identity if we knew what is stamped or written on the back of the print. May we please be told?